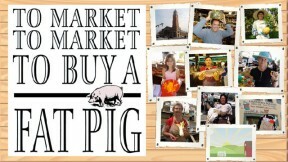 In this program that celebrates American market houses, market places, and farmer's markets, Rick Sebak sinks his teeth into the pies of Cleveland, the salad greens of Santa Fe, the crab cakes of Baltimore, and the heirloom tomatoes of Asheville, North Carolina in "To Market to Market to Buy a Fat Pig". The whole crew got to drink coconuts in Hilo, Hawaii, and crunch on the special celery of Lancaster, Pennsylvania. They bought berries in Santa Monica, California, and fruits and vegetables that they had never seen before in Decatur, Georgia. "You know, I never cook up these shows by myself," said Sebak, "We're like a group of chefs that all contribute to the final presentation."